The whistle announcing the new Addis Ababa-Djibouti train departure is perfectly on time. Chinese and Ethiopian railway staff members aligned along the platform in formal posture – their stiffen arms stretched along the hips, their chests bellied out under the red uniforms – see off the train. Efficiency and discipline, symbols of the strong political and economical cooperation between Chinese and Ethiopian governments, whereof the train is the most valuable outcome. The 4billion US$ train, financed for the most part by Export-Import Bank of China, was implemented by China Railway Engineering Corporation. Locomotives, railway carriages and stations are near-identical copies of those that were to be found in China before the government began swapping them out for high-speed trains. They have been designed using the same standards, up to the very same colors and displays. Railway staff members are mostly from China as well: according with specific agreements, Chinese staff will fulfill the training process of their Ethiopian colleagues, which are expected to take full charge of railway management in 2023. The same pattern occurs in other African countries, where Chinese capitals and companies are giving new life to Africa’s old colonial railway routes. One year ago, the “Madaraka Express” – thus renamed by president Uhuru Kenyatta to commemorate Kenya’s independence anniversary – was inaugurated. 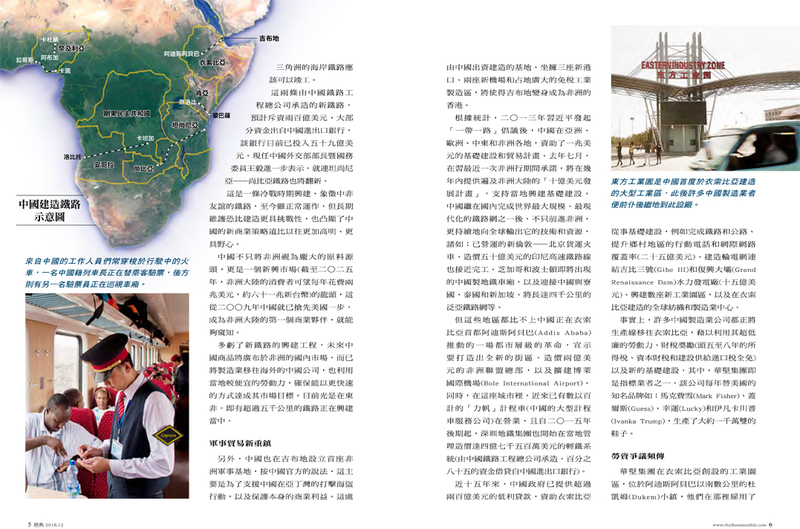 The new Nairobi-Mombasa railway (which costs 3.8billion US$, 85 per cent financed by Export-Import Bank of China) has been implemented by China Road and Bridge Corporation, another state-owned company which builds in Africa on Beijing’s behalf. The train replaces the British colonial one, which was in operation since 1901 up to April 2017. Also known as “Lunatic Express”, the old train suffered of a huge implementation cost while thousands of workers (most of them Indians) were killed by harsh working conditions, diseases and even lions. Construction of the new railway started in December 2014 and the first section, Nairobi-Mombasa line, was completed in less than 3 years. By year end, the railway is expected to connect as well Nairobi to Naivasha and Naivasha to Kisumu. The regional project will then be extended to Kampala (Uganda) and Kigali (Rwanda), and later to South Sudan. The railway has been built primarily to help ease the transport of 22million tons of imports, which arrive every year at Mombasa’s ports and are hauled mainly on trucks. The first new commercial cargo train arrived in Nairobi last January with 104 containers, almost equivalent to the number of trucks operating daily on the Mombasa-Nairobi highway. Chinese play a major role in this trading flow. Just in Kenya imports from China grew up to 5billion US$ in 2016, with a threefold increase as compared to 2010. Kenya railways subcontracted 400 Chinese staff to help operate the train over the next 10 years. At the new Mombasa train station there is even a statue representing Zheng He, a 15th-century Chinese explorer who sailed to East Africa. In Angola, China Railway Engineering Corporation renewed the old “Caminho de Ferro de Benguela” built by Portuguese colonizers: 1,350 kilometers railway linking the Atlantic Lobito’s port to Katanga region, a mining area immediately beyond the Congolese border, which supplies 50 per cent of the world’s cobalt, in addition to copper, iron, manganese and nickel. The rail line was closed during the Angolan civil war (1975-2002) and remained off-use afterwards cause of equipments and tracks deterioration. The rehabilitation began in 2005 under a oil-for-infrastructure deal between Angola and China governments. 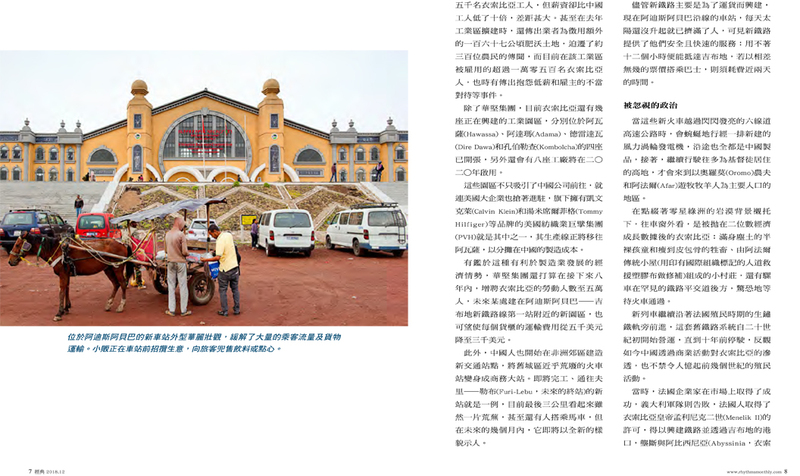 China built tracks and stations, importing most of its own workers who lived in tented camps alongside the railway. Also the locomotives came from China. The new train was formally inaugurated in February 2015, but keep having big troubles to get into operation. In Nigeria started to operate the Abuja-Kaduna (190 kilometers) train, a stretch of the new Lagos-Kano (830 kilometers) railway line, which is expected to be completed by year end. A coastal railway line from Lagos to Calabar passing through Niger river delta should be ready by end of 2019. Implemented by China Railway Engineering Corporation, the two new railways are expected to cost 20billion US$, with most of the funding coming from the Export–Import Bank of China, which has so far released 5.9billion US$. Even the Tanzania-Zambia railway will be revitalized, according with Wang Yi, former China’s foreign minister and at present Chinese State Councilor. Built during the Cold War and greeted as a symbol of Chinese-African friendship, the “Tazara” train has strived to keep regular service, showing that long-term maintenance could be more challenging than implementation. Chinese new commercial strategy, much more sophisticated and ambitious than the previous one which looked at Africa just as a huge raw materials mine, aims at becoming the undisputed leader on Africa’s emerging markets (by 2025 the continent’s consumers are expected to spend 2trillion US$ a year). In 2009 China overtook the US becoming the first commercial partner of the African continent. Thanks to the new railways, Chinese goods will get an extensive and wide access to African internal markets, while Chinese companies which have relocated manufacturing offshore, profiting of cheaper manpower, will get advantage of a fast and safe way to reach their wealthy final markets. Just in East Africa at present over 5,000 railway kilometers are under construction. 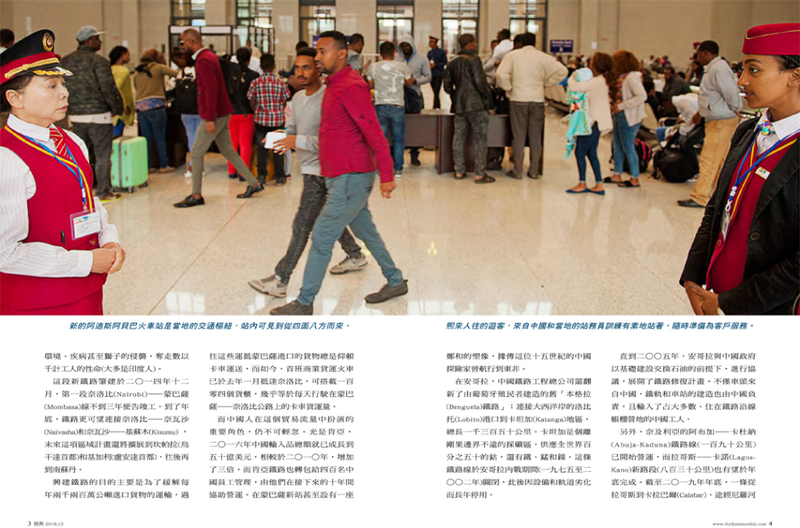 Djibouti, where Chinese set up their first continental military base – a supply center, intended primarily to support China’s anti-piracy efforts in the Gulf of Aden and protect its commercial interests, according with Chinese officials – is ready to become the Hong Kong of Africa thanks to three new ports, two new airports and a huge tax-free manufacturing area, all financed by China. Through the “One Belt One Road” Initiative launched in 2013 by president Xi Jinping, China is funding 1trillion US$ infrastructure and trade projects throughout Asia, Europe, the Middle East and Africa. Last July, during his latest African tour, Xi pledged billion US$ development projects across the continent over the next years, intended mainly to financing infrastructures. Having implemented in the homeland one of the world’s most extensive and modern railway network, China is now exporting its know-how and resources globally. A new London-to-Beijing freight train is already operative. A 5billion US$ high-speed rail line is almost completed in Indonesia. Chinese subway cars will soon appear in Chicago and Boston. The 4,000 kilometers Pan-Asia Railway Network, which would link China to Laos, Thailand and Singapore, is under construction. But few places are being reshaped by Chinese like Ethiopia. 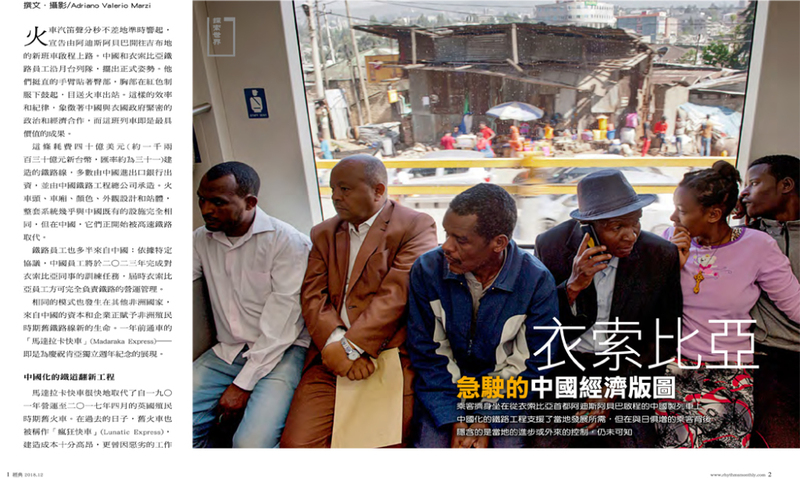 In Addis Ababa, China is driving a urban revolution. Chinese built whole new neighborhoods, the new 200million US$ African Union headquarters, the Bole international airport enlargement. 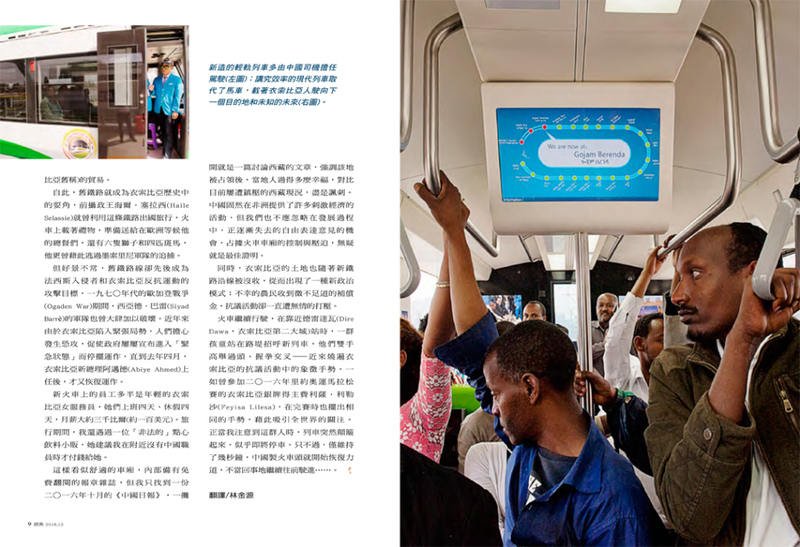 Hundreds of “Li Fan” taxis have been recently put into service in the African diplomatic capital and since late 2015 Shenzhen Metro Group is managing a 475million US$ light-railway system (implemented by China Railway Engineering Corporation and 85 per cent financed by an Export-Import Bank of China loan). In the latest 15 years Chinese government has provided more than 20billion US$ low interest rate loans to finance Ethiopian infrastructures: implementing railways and highways, expanding mobile and internet coverage in rural areas (2.5bilion US$), engineering power-grid transmission to connect Gibe III and Grand Renaissance Dam Hydropower plants (1.5bilion US$), building several new industrial parks which aim transforming Ethiopia in a new global hub for textile and manufacturing. Many Chinese manufacturing companies are relocating their productions to Ethiopia taking advantage of ultracheap manpower, fiscal incentives (total income taxes exemption in the first five/eight years as well as on duties on capital goods and construction supplies importation) and new infrastructures. The Huajian Group – which manufactures approx. 10milion pair of shoes for US labels like Mark Fisher, Guess, Lucky and Ivanka Trump’s line – has been a pioneer. Zhang Huarong, Huajian founder, contributed to establish the first industrial park in Ethiopia: the Eastern Industrial Zone (EIZ) in Dukem, a small town a few kilometers south of Addis Ababa, where at present about 5,000 Ethiopian workers are employed at salaries almost ten times lower than those paid in China. Every pair of the 2.5milion shoes produced here is exported tax-free to the US thanks to the African Growth and Opportunity Act, a US Trade Act intended to enhance market access for Sub-Saharan African countries. Today the EIZ hosts more than 20 Chinese companies including leather processors, steelmakers and pharmaceutical. Last year the Zone embarked on a new expansion phase, expropriating an additional 167 hectares of fertile land and causing the relocation of around 300 farmers. The EIZ currently employs more than 10,500 Ethiopian, but local workers complain of low wages and poor treatment by employers. The new Ethiopian Industrial Parks – four have been already opened (in Hawassa, Adama, Dire Dawa and Kombolcha), eight more should be ready by 2020 – are attracting not only Chinese companies: PVH, a US textile giant owning labels as Calvin Klein and Tommy Hilfigher, moved its production to Hawassa in response to rising costs in China. In presence of favorable economic conditions for manufacturing, Huajian is extending its Ethiopian factories: Mr. Zhang’s company occupied the largest area in the new Adama Industrial Park. When it will be fully in operation, Huajian plans to expand its Ethiopian work force to 50,000 people within the next eight years. The Park has been built nearly the first halt of new Addis-Djibouti train, which is expected to knock down shipping prices from 5,000 US$ to 3,000 US$ per container. In fact – unlike French and English colonizers, who in 19th and 20th centuries would set up railway stations at the heart of the old cities – Chinese are building their new stations in faraway suburbs, almost deserted areas to be turned into commercial terminals. The taxi trip takes more than one hour to cross Addis Ababa, waking up among grazing sheep and runners performing their morning training. The road to the new Furi-Lebu station is not yet finished and the last three kilometers are muddy, like all the area around. Some passengers reach the station on Piaggio and Bajaj rickshaws, some other on horses-carts. One line of new Addis Ababa light train is expected to be extended to the Furi-Lebu station in some months. Sun hasn’t risen yet but the station is already crowded. The new railways have been built mainly for goods transportation but they are too a big opportunity for African passengers, since they offer them a safe and fast service: the new train takes less than 12 hours to Djibouti as compared to almost two days journey by bus, with no difference in ticket price (in Kenya and Nigeria high demand and poor booking system have induced a brutal ticket-touting). I’m traveling at the eve of Fasika, the Ethiopian Orthodox Easter. My journey-mates are mostly Muslim students taking the opportunity of the University break to visit their families in the East of the Country, where in the 7th century Islam arrived in Africa. The train crosses over a gleaming six-lane expressway and snakes past a row of newly erected wind turbines, all Chinese-built. Then it slopes down the Highland, where the majority of the population is Christian, and runs across areas populated mostly by Oromo peasants and Afar nomadic shepherds. On the background of a rocky desert spotted by rare green oasis, the Ethiopia left behind by recent double digit economic growth appears beyond the train-window: half-naked kids covered with dust grazing skinny animals, small villages made of burra (Afar traditional huts) patched-up with humanitarian aid plastic sheets branded by international organizations, carts pulled by mules waiting scared behind the rare rail-crossings. For longer stretches, the new train runs alongside the rusted trucks of the old French colonial railway, in operation since the beginning of the 20th century until a decade ago. Today China’s commercial penetration in Ethiopia traces too the former centuries’ colonization. French entrepreneurs were successful whereas Italian army had failed (the well-known Adwa military defeat in 1896), obtaining from Emperor Menelik II the permission to building the railway and trade monopoly with Abyssinia through Djibouti port. Since then the old train was protagonist of Ethiopian history. “The Negus”, Emperor Haile Selassie, used it for his first journey abroad – on the train, among the presents for governors waiting for him in Europe, there were six lions and four zebras – as to run away from Mussolini’s army. The railway route was target first of fascist invaders and later of arbegnocc, the Ethiopian resistance movement. Siyad Barrè army vandalized it too during Ogaden war in the Seventies. Today there is dread about terrorist attacks cause of the violent tensions inflaming Ethiopia in the latest years, which pushed the government to proclaim repeatedly the “emergency state”. The most recent was abrogated by new prime minister Dr. Abiy Ahmed immediately after taking charge (last April he was nominated in place of the resigning Haile Mariam Desalegn). The new Ethiopian leader is engaged on strong peace and stabilization process, not only inside Ethiopia but in the whole Horn of Africa, as shows the recent historic peace agreement with Eritrea: following two bloody military campaigns and twenty years Cold War, the armies have been withdrawn from the border and people’s freedom of movement has been restored. On the train, railway staff members are mainly young Ethiopian hostesses, who work on a 4-days on/4-days off basis for a 3,000 birr monthly salary (about 100 US$). During my trip I meet as well an “illegal” snacks&drinks vendor, who recommends me to pay her only when no Chinese staff are around. The comfortable carriage is equipped with a shelf for free consulting newspapers and magazines. Inside it I can find just one copy of China Daily dated October 2016, when the train was officially inaugurated by authorities (but came into operation just last January). The newspaper is open on an article about occupied Tibet, which emphasizes the wellbeing of local population vs. Western detractive campaigns highlighting repression and discontent. Those who welcome the generous Chinese economic cooperation in Africa should not overlook that on the Chinese-Train-to-Development the freedom-of-expression carriage is missing, while control-and-repression occupy undisputedly the locomotive. A political model followed by Ethiopia too, as show land disendowments along the new railway: the unlucky peasants received peanuts, while protests have been repressed mercilessly. Approaching Dire Dawa station, while running on a gouged stretch, a bunch of kids standing on the railway embankment hail the new train with arms crossed and fists over their heads – the symbol of the massive protests enflaming Ethiopia in recent years, the same gesture made by Ethiopian Olympic marathon silver medalist Feyisa Lilesa as he finished his race in Rio 2016 calling the world’s attention. Exactly when I notice them, the train suddenly starts bumping and seems about to stop. But the inconvenience lasts just a few seconds. The Chinese locomotive gets its strengths back and keeps straight carelessly.